American Antique Furniture | Chippendale Mahogany Bombe Chest-on-Chest | Skinner Inc.
You never forget the thrill when great antiques or fine art sell at auction. This post is the first in a series telling the stories behind some of the top highlights in Skinner auctions from the past decade. Through telling these stories, we hope to shed light on where the market has been and where it’s going now. Extraordinary American antique furniture never goes out of style. The elegant proportions and masterful craftsmanship of a fine piece of furniture in original condition will always attract interest and command high prices at auction. Just under a decade ago, Skinner made history when we sold an 18th century Chippendale Mahogany Carved Scroll-top Bombe Chest-on-Chest for $1,766,000. 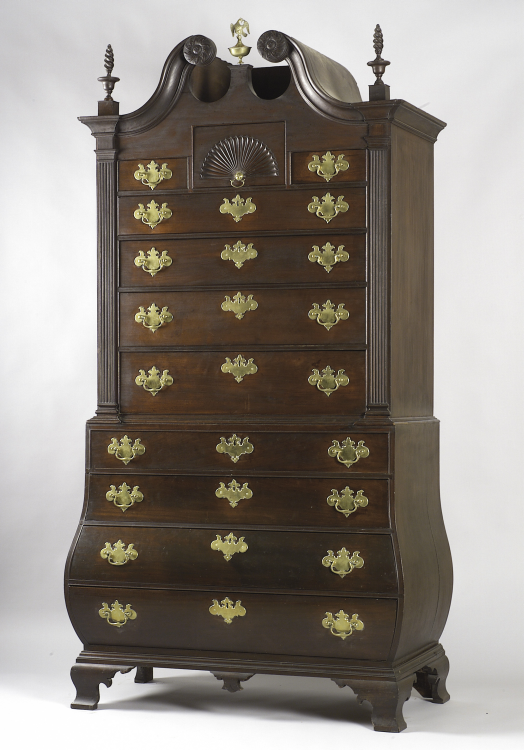 This lovely example of the rare American furniture form was made in Boston or the North Shore of Massachusetts, and remained in very fine condition, retaining its old surface and original brasses. Stylistically, the piece most closely resembles one in the collection of Colonial Williamsburg. The Chippendale Chest was one of the finest examples of American furniture I have found in my years of working in this business, and Skinner was truly privileged to have the opportunity to offer it at auction. It seems only fitting to me that after more than 200 years, it was auctioned in Boston — the city in which it was likely made. The provenance of the chest is also notable. Family papers verify that the piece once belonged to Robert “King” Hooper, prominent Marblehead merchant and one of the wealthiest men in 18th century America. Hooper, through a series of provident events and strategic decisions, became a powerful force in the colonial fishing industry in Massachusetts, playing a vital role in providing cargo essential to the British “Triangle Trade.” A Loyalist during the American Revolution, Hooper subsequently lost the fortune he had amassed, but in the middle decades of the 18th century, his lifestyle and the home and furnishings he enjoyed had reflected that of British high society across the ocean. It’s extremely rare to discover a piece of furniture this beautiful and pristine, but I know there are more out there. As an expert American antique furniture appraiser and regular on the Antiques Roadshow, I’m always on the lookout for the next great find. If you have a piece of antique furniture in original condition and would like me to take a look, please call and set up an appointment at 508-970-3299. This entry was posted in Blog and tagged American antique furniture, American furniture, American Revolution, Americana, antique furniture, Auction Highlights, bombe, chest-on-chest, chippendale, chippendale chest, furniture appraiser, made in Boston, mahogany, Marblehead merchant, Stephen Fletcher by Stephen Fletcher. Bookmark the permalink. What a singular piece of furniture … and “King” Hooper no less!! All the best. Hi Terry, Skinner’s Appraisal Department would be more than happy to assist you in finding out more about your cabinet, please submit photos and an auction evaluation form via our website: https://www.skinnerinc.com/selling/auction-evaluation-form/ or contact the Appraisal Department directly at 508-970-3299 or appraisals@skinnerinc.com. Thank you!